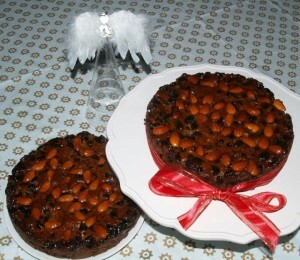 This is a really delicious fruitcake, very quick and easy to make. An excellent Christmas cake. Grease and line spring-form base with baking paper or foil. Place fruit mix,soy milk,margarine and sugar into a saucepan gently stir and heat. Pour mixture into a mixing bowl and add salt,baking soda,baking powder and flour. Use a spatula or wooden spoon to combine all ingredients. Fill spring-form with the cake mixture. Smooth the top of the cake using a wet spatula. Decorate with almonds and cherries. Bake 1 hour 50 minutes, or until cake tester comes out clean. For small cakes the baking time would be approximately 50-60 minutes or until cake tester comes out clean. Cool and remove the cake from the baking tin. Using a small saucepan heat the apricot jam with 1-2 tbsp of water and brush over cake with a pastry brush. Comments – The cake freezes well. This recipe makes one 24cm cake in spring-form cake tin or 2 small cakes in sponge tins.